An Army search dog who saved lives in Afghanistan has been honoured with the animal version of the Victoria Cross. 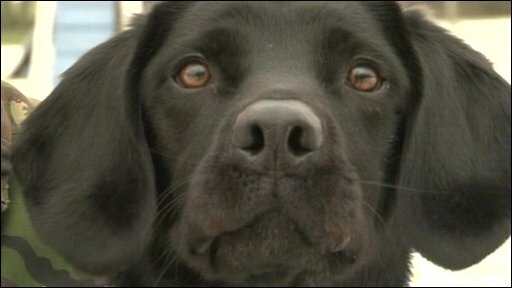 Black Labrador Treo, eight, was awarded the Dickin Medal at the event at the Imperial War Museum in London. 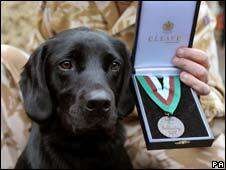 Treo is the 63rd animal to receive the medal created by veterinary charity the PDSA to honour gallantry in war. The medal, which is the highest accolade a military animal can be awarded, was presented by Princess Alexandra. A total of 26 other dogs, 32 World War II messenger pigeons, three horses and one cat have won the award, introduced in 1943 by Maria Dickin, the founder of the PDSA - People's Dispensary for Sick Animals. Handler Sgt Dave Heyhoe joined his dog at the ceremony on Wednesday. Sgt Heyhoe said: "We started our time together in Northern Ireland, then moved to North Luffenham, where we then went out to Afghanistan in 2008." Treo was one of 25 dogs in the country supporting British troops on patrol. His work involved searching for arms and explosives. Sgt Heyhoe said: "It's very important. We are part and parcel of the search element. We're not the ultimate answer but we are an aid to search." Treo was working as a forward detection dog in Sangin when in August and September 2008 he found two hidden "daisy chain" bombs made out of multiple explosives wired together. His handler said Treo's detective work saved the lives of many soldiers. Sgt Heyhoe added the pair had a "rapport" and understood each other. He said the award was for every dog and handler working in Afghanistan and Iraq. Maj Chris Ham, officer commanding the Canine Division at the Defence Animal Centre in Melton Mowbray in Leicestershire, said dogs played an important role in missions overseas. He said: "It's being recognised more and more in this day and age that the key capability the armed explosives dog does have lies particularly in finding improvised explosive devices."